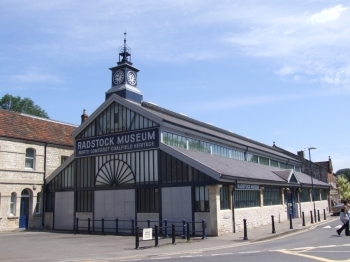 Situated at the heart of the former Somerset Coalfield, the Old Market Hall in Radstock town centre displays a Heritage Collection of artefacts and memorabilia from the era of Victorian mining in Somerset. Come and immerse yourself in the life and times of a Somerset Miner and his family. Discover the coal face where he worked, visit the store in which his wife shopped and sit at the desks where his children went to school. Our 7 day weather forecast for Radstock updated throughout the day, making it ideal for planning leisure activities, travel and events. Read more about our weather forecasts. On Monday 22nd April 2019 the sun will rise at 06:00 and will set at 20:17. It will be a mild day, with temperatures reaching around 19.8°C. Today is expected to be a dry day, with a very low chance of rain. It will be quite a breezy day, with a maximum expected wind speed of 17mph. On Tuesday 23rd April 2019 the sun will rise at 05:58 and will set at 20:19. It will be a mild day, with temperatures reaching around 20.9°C. Today is expected to be a dry day, with a very low chance of rain. It will be quite a breezy day, with a maximum expected wind speed of 17mph. On Wednesday 24th April 2019 the sun will rise at 05:56 and will set at 20:21. It will be a mild day, with temperatures reaching around 12.5°C. Some moderate to heavy rain is expected, 5mm of rainfall is possible today. It will be quite a breezy day, with a maximum expected wind speed of 23mph. On Thursday 25th April 2019 the sun will rise at 05:54 and will set at 20:22. It will be a mild day, with temperatures reaching around 12.1°C. Today is expected to be a dry day, with a very low chance of rain. It could be quite a gusty day today, with a maximum expected wind speed of 29mph. On Friday 26th April 2019 the sun will rise at 05:52 and will set at 20:24. It will be a mild day, with temperatures reaching around 13.2°C. Today is expected to be a dry day, with a very low chance of rain. There could be quite a strong breeze in the air today, with a maximum expected wind speed of 24mph. On Saturday 27th April 2019 the sun will rise at 05:50 and will set at 20:26. It will be a mild day, with temperatures reaching around 12.3°C. Some moderate to heavy rain is expected, 5mm of rainfall is possible today. It could be quite a gusty day today, with a maximum expected wind speed of 32mph. On Sunday 28th April 2019 the sun will rise at 05:48 and will set at 20:27. It will be a mild day, with temperatures reaching around 6.4°C. Today is expected to be a dry day, with a very low chance of rain. There will be a gentle breeze in the air today, with a maximum expected wind speed of 17mph. Our weather forecast for Radstock is updated throughout the day and has been found to be very reliable for planning activities such as days out, leisure, travel, events, fishing, golf and gardening. Situated at the heart of the former Somerset Coalfield, the Old Market Hall in Radstock town centre displays a Heritage Collection of artefacts and memorabilia from the era of Victorian mining in Somerset. Come and immerse yourself in the life and times of a Somerset Miner and his family. Discover the coal face where he worked, visit the store in which his wife shopped and sit at the desks where his children went to school.